And then at #10 we have the sizzurp-slurping Far*East Movement, whose "Like A G6" makes me feel like drowning myself in a tub full of grain alcohol. Hey, kids—getting fucked up is fun! And so is getting arrested! Paaaaaaaarty! 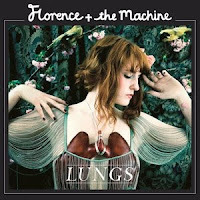 Moving on to classier trash, two singles jump 72 positions this week—Rihanna's "Only Girl (In The World)" (up from #75 to #3) and Florence + The Machine's "Dog Days Are Over" (#93 to #21). RiRi's jam benefits from being added to iTunes last week, while Flo performed on the MTV VMAs two Sundays ago. And in slightly Sophie Ellis-Bextor-related news, Armin Van Buuren's Mirage, which contains their collaboration "Not Giving Up On Love," debuts at #148. I'm playing their jam this very moment in celebration of this momentous triumph. it's about f$%ing time! Filipinos represent!